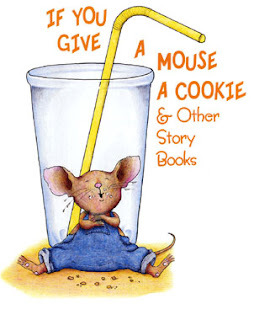 Disco Mommy's Random Thoughts: If You Give A Mouse A Cookie! My Sister-In-Law recently called me and compared her life to this book. I too have felt caught up in my own version of this story. Mine is called If you Give a Mommy Some Flooring. She will save for a year to buy it. She will save money in the form of gift cards. She will begin planning the project. Then, she will discover she has a slab leak. She will spend two weeks interviewing companys. She will have it fixed. She will have to pay a lot of money since the company does not take Lowes gift cards. Having it fixed means living somewhere else for 2 days. After having it fixed, she will again begin planning the floors. She will find a great deal on the flooring of her dreams. She spends 2 days packing up the entire house. She picks an installer that works 7:30am-7:30pm. She thinks it will take two days. Her family lives in the car for 8 days. They eat at a lot of restaurants. She spends 2 days unpacking the house. She discovers the dishwasher does not work. She spills wine on her hubby's keyboard. She buys him a new one. This whole time, her hubby has been working. So much he gets a bonus. He buys her a new dishwasher. She tries to have them installed. The company gives her the run around. Her hubby tries to install them himself. Her Father-In-Law tries to install them. He only gets the dishwasher to work. Her hubby messes with the oven again. He blows the circuit to the oven. Having said all that I would like to follow up with this. I am grateful for my new pipes...that means I own a home. I am grateful to be waiting for an electrician...that means I can afford electricity. I am grateful for the snoring log that sleeps next to me...that means he is home with me and not off working a second job so we can have more stuff that will mostly likely just break. Wow...you write like you've been blogging your whole life!!! Welcome to the blogworld!!! And thanks for the reminder of all we have to be thankful for. Your snoring log adores you!